A new system at SLAC National Accelerator Laboratory’s X-ray laser narrows a rainbow spectrum of X-ray colors to a more intense band of light, creating a much more powerful way to view fine details in samples at the scale of atoms and molecules. “It’s like going from regular television to HDTV,” said Norbert Holtkamp, SLAC deputy director and leader of the lab’s Accelerator Directorate. 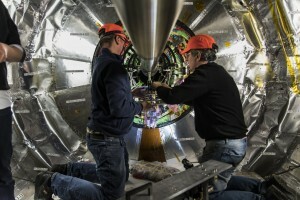 Designed and installed at SLAC’s Linac Coherent Light Source (LCLS) in collaboration with Lawrence Berkeley National Laboratory and Switzerland’s Paul Scherrer Institute, it is the world’s first “self-seeding” system for enhancing lower-energy or “soft” X-rays. Scientists had to overcome a series of engineering challenges to build it, and it is already drawing international interest for its potential use at other X-ray free-electron lasers. LCLS’s laser pulses vary in intensity and color, and this randomness or “noise,” like fuzzy reception on a TV, sometimes complicates experiments and data analysis. Self-seeding cuts through this noise by providing a stronger and more consistent intensity peak within each laser pulse. Scientists had installed another self-seeding system at LCLS in 2012 for higher-energy “hard” X-rays. It has been put to use in studies of matter under extreme temperatures and pressures, the structure of biological molecules and electron motions in materials, for example. Extending self-seeding to soft X-rays was a logical next step. LCLS scientists Yiping Feng, Daniele Cocco and others designed a compact X-ray optics system that was key to the success of the project, which was led by SLAC’s Jerry Hastings and Zhirong Huang. The team achieved self-seeding with soft X-rays in December, and conducted follow-up tests in January and February. They are working to improve the system and to make it available to visiting scientists. LCLS X-ray pulses are powered by an electron beam from SLAC’s linear accelerator. The electrons wiggle through a series of powerful magnets, called undulators. This forces them to emit X-ray light, and that light grows in intensity as it moves through the undulator chain. The new system, installed about a quarter of the way down the undulator chain, diverts a narrow, purified slice of the X-ray laser light and briefly and precisely overlaps it with the beam of electrons traveling through the undulators. This produces a “seed” – a spike of high-intensity light in a single color – that is amplified as the X-ray pulses move through the remaining undulators toward LCLS experimental stations. The Berkeley Lab team designed and built the hardware that diverts and refines the X-ray light, as well as mechanical systems that align the X-rays and electrons, adjust the X-ray energy and retract components out of the path of X-rays when not in use. The Paul Scherrer team designed and built the optical equipment for the system. SLAC was responsible for integrating the components and building the controls that automate the system. “This project was pretty challenging in that we were designing and developing and installing this equipment in an operating facility, with little time for the actual installation,” said Ken Chow, the lead engineer for the Berkeley Lab effort. 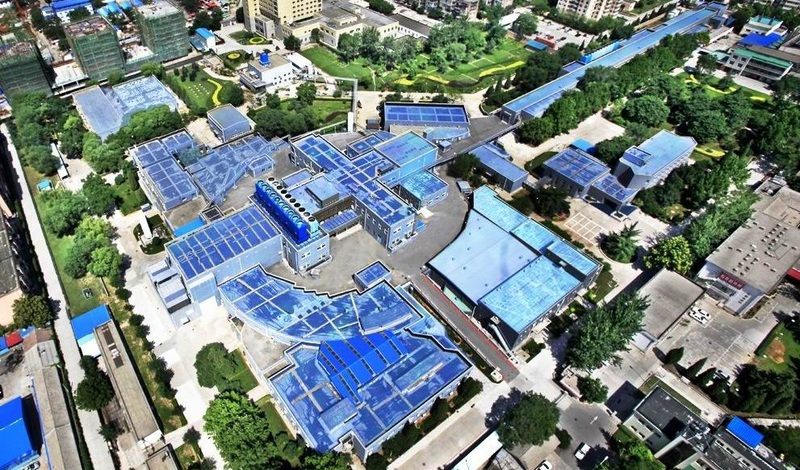 He noted that the project required many custom parts, such as a movable mirror that must rotate with incredible precision – “It’s like taking a meter stick and moving one end one-half millionth of a meter,” he said. 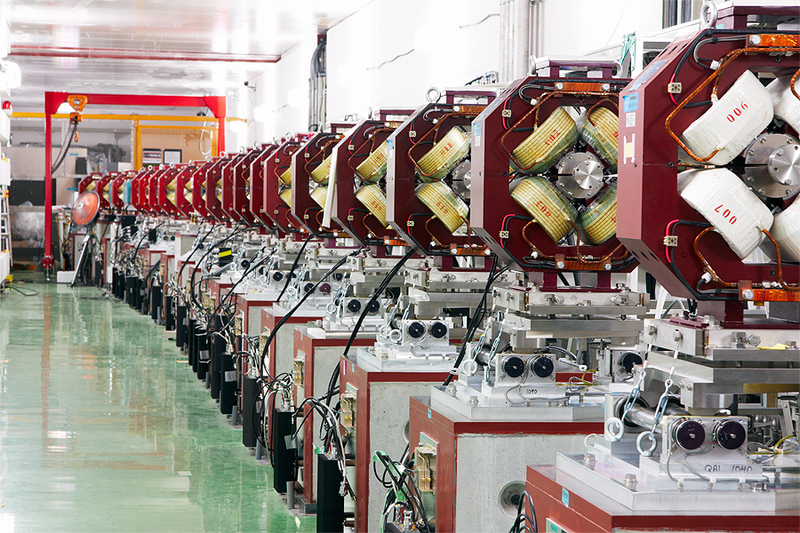 SLAC scientists are hoping to use the seeding system, coupled with an intricate tuning of the magnets in the undulators, to produce even higher-intensity pulses for the next generation of X-ray lasers. Already, collaborators from the Paul Scherrer Institute are considering a similar self-seeding system for a planned soft X-ray laser in Switzerland, and there has been great interest in such a system for other X-ray laser projects in the works. “We would like to learn and profit from this for our own project, the SwissFEL,” said Uwe Flechsig, who led the Paul Scherrer team that was responsible for delivering the system’s optics. Enjoy, and, stay tuned. The future is going to be exciting. 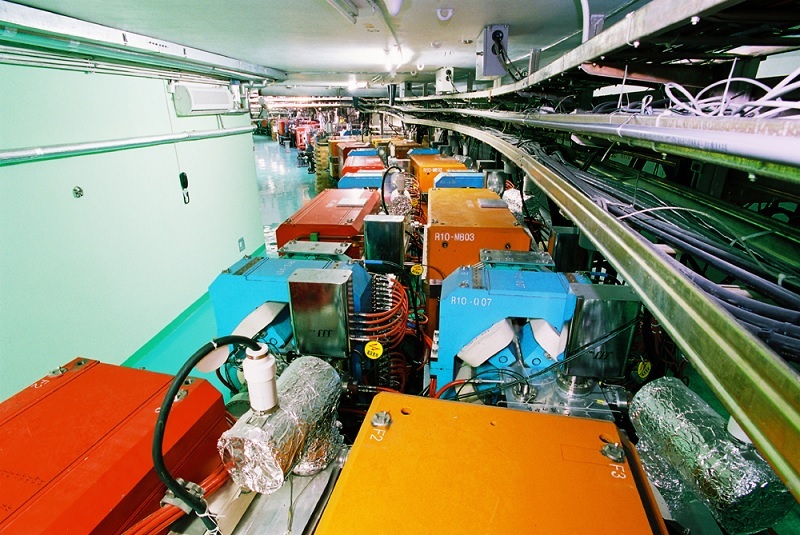 “Researchers are taking a step towards the realisation of the International Linear Collider’s (ILC) SiD detector with a test beam of a SiD-specific electromagnetic calorimeter (ECAL) planned for this month at SLAC. Engineering drawing of the electromagnetic calorimeter at SLAC. This drawing shows the full depth of the ECAL, but unlike the real calorimeter, it is only one sensor wide. The sensor, though not visible in the drawing, is located underneath the hexagonal brown cable. Image courtesy of Marco Oriunno. This initial test beam could actually be considered a ‘test’ test beam, as this run will utilise a partial calorimeter. Researchers involved in the SLAC, University of Oregon, UC Davis and UC Santa Cruz (US) collaboration hope to identify any early problems with the beam and the calorimeter’s sensors and electronics. They plan to conduct the initial test on 23 July and hope to complete the second ‘real’ run by the end of the year. Work on this silicon-tungsten ECAL began prior to the selection of the ILC design in 2004, when SLAC was still working toward its Next Linear Collider design. Major steps along the way have involved developing the current sensors, which convert the energy of particles into electronic signals, and the readout electronics, which process these signals. 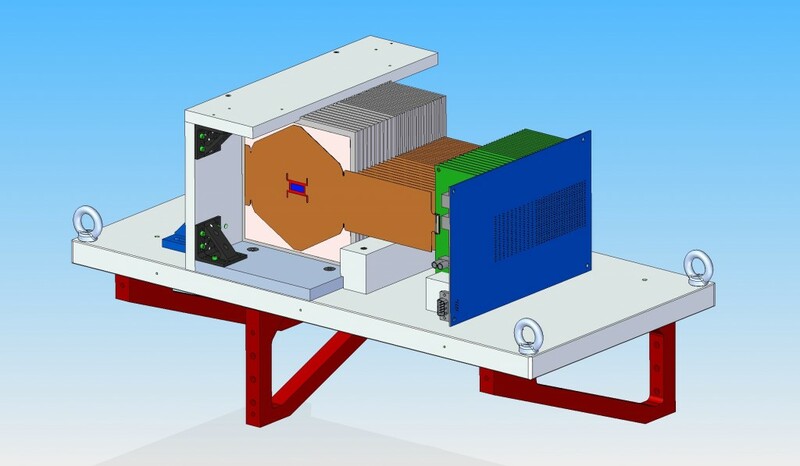 The current SLAC ECAL system is a prototype for the ECAL needed for SiD, one of the ILC’s two proposed detectors. Both detectors will use an algorithm called particle flow to identify and measure the energy of the jets of particles formed when the electrons and positrons collide in the ILC. The role of the ECAL system is to measure the energy and direction of certain particles – photons, electrons and positrons – as they hit the calorimeter. To do this, the ECAL must have very high spatial resolution and good energy resolution to distinguish the location and energy of different particles. For the SLAC ECAL, achieving this high resolution while remaining compact and cost-effective involves several innovative features. Two of these features are the small pixel size of the sensors and the small gaps between the calorimeter’s tungsten plates, where the sensors are located. Each of the calorimeter’s sensors has 1024 pixels, and the gaps in the test calorimeter are only 1.25 millimetres wide, though researchers hope to reduce them to 1 millimetre. Keeping the pixel size and the gaps small allows the particles depositing energy in the calorimeter to be more easily distinguished from one another. In addition, the ECAL’s readout electronic chips are attached directly to the sensors, a setup that saves space by removing the need for bulky signal cables. Connecting these electronic chips to the sensors through a method known as bump bonding has been one of the recent challenges in the preparation of the calorimeter for the test beam. In fact, this challenge is one reason the calorimeter will be only partially assembled at the time of the first test, having only 12 of the 31 sensors that it will ultimately include. In addition to testing the function of the beam and electronics, the researchers plan to use the initial test beam to evaluate the calorimeter’s signal-to-noise ratio. 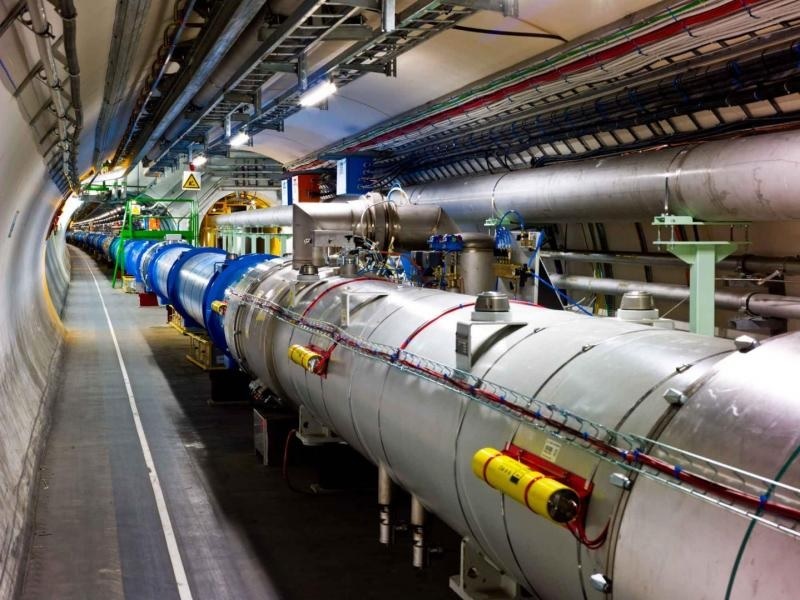 “According to the paper, top priority is given to the continued operation of the LHC and its future upgrade for operation at higher luminosities, to ensure the exploitation of its full scientific potential. Other priorities for large-scale physics facilities are the development of a post-LHC accelerator project at CERN with global contribution, the European participation in the linear accelerator ILC if hosted by Japan and the development of a European neutrino research programme. 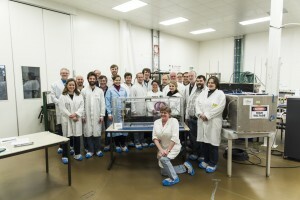 Moreover, the European Strategy recommends the continuation of a strong and diversified theory programme, studies in specific areas of particle physics in Europe and other regions with European participation, extension of research and development of innovative detector technologies and close collaboration with neighbouring fields such as astroparticle physics and nuclear physics. The strategy stresses the importance of global collaboration in the field of particle physics and the coordinating role of CERN; this includes the strengthening of cooperation between the community of particle physicists and the European Commission. It also emphasises the social benefits and the research field’s responsibility: it is important to ensure that central scientific activities such as communication and outreach will become part of all projects, that technology transfer is supported and that young scientists will always get a good training. The European Strategy is regularly updated on the basis of current scientific results. With the discovery of the Higgs-like particle in summer 2012, the already planned update for this year had become even more urgent and concrete. 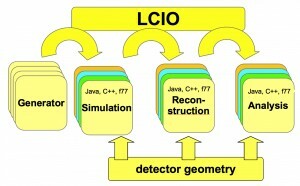 The strategy is developed by the CERN Council Strategy Group, appointed by the CERN Council. It consists of representatives of all CERN member states, eight members of the European Committee for Future Accelerators ECFA and of the CERN Scientific Policy Committee (SPC), representatives of observer states and the directors of the largest European research centres. The Strategy Group is headed by former ECFA chairman Tatsuya Nakada. 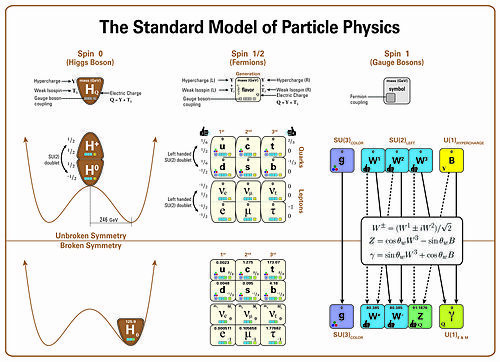 In the past months, the group gathered recommendations from many projects, groups, countries and collaborations and, after consultation with the European community of particle physicists at a symposium in Cracow of several days, they wrote up a summary of about 15 recommendations. See the full article here. The article includes links to other material. A new facility opens for experiments this week in SLAC’s historic End Station A, where the first evidence for quarks was discovered. Electrons are once again streaming into SLAC’s End Station A, setting the stage for a new facility in the huge, concrete hall where the first evidence for quarks was discovered. It was there that a research team including SLAC and MIT physicists used SLAC’s electron beam to discover that protons in the atomic nucleus were composed of smaller entities called quarks. That research led to the 1990 Nobel Prize in Physics. The new facility, called the End Station Test Beam, will host experiments that test detector parts and experiments that will aid in the design of a proposed international linear collider project. The first experiment, which will be carried out by SLAC researchers as part of the commissioning process, is being installed this week. The first outside users are expected to arrive in about a month. You can imagine the need for focusing by envisioning a street corner. If this is an intersection of two wide avenues, people can probably walk past each with little chance of collision. But if it’s a very narrow space with just enough of a crowd, people may be forced into each other. As it’s these collisions that scientists are after, the particle bunches need to travel in a tight pathway to increase the collisions achieved. For a more scientific analogy of how this funnelling of the beam’s path is achieved, Fermilab scientist Elvin Harms likens final focus to a telescope. ‘You might say the final focus quadrupole circuits are like a telescope. There is strong focusing near the collision point—much like an objective lens—and weaker focusing—like an eyepiece—further away,’ Harms says. “The Department of Energy’s newest user facility – a cutting-edge particle accelerator available to scientists from all over the world – is a radical new chapter in the history of the world’s longest, most powerful linear accelerator. For more than four decades, the two-mile-long linac at SLAC National Accelerator Laboratory fueled Nobel-winning particle-physics research. Now it’s been repurposed – one might even say reimagined – in ways that keep it at the forefront of discovery, and not just in particle physics. The final third of the linac now powers the Linac Coherent Light Source, the world’s first hard X-ray laser. Researchers from around the world use LCLS’s unique ability to take crisp pictures of atomic motion and changes in chemical bonds to drive applications in energy and environmental sciences, bioscience and materials engineering. Today’s news release is here. Here are the links and some images to stimulate your curiosity. See this full article here.